During the Mubarak-era, beards were a no-no in Egypt - but now they're back in fashion with a vengeance. In the Arab and Muslim world, facial hair signifies a lot more than personal style, writes Cairo-based journalist Ashraf Khalil. A couple of years ago, I was with my parents in a mosque near Chicago. They introduced me to an old family friend - a lady who'd known me since I was a kid but hadn't seen me for years. She embraced my mother and shook hands with my father, but when she turned to me she stood about a foot away from me, didn't offer to shake my hand and instead sort of awkwardly waved. My father asked her why she had been so distant and she said it was because of my beard. She assumed that my facial hair was symbolic of a deep Islamic religiousness and was afraid that if she offered her hand to shake, I wouldn't take it. My father, who knows exactly how non-religious I am, still LOVES to tell this story. In the Arab and Muslim world, facial hair means far more than just style and grooming. It's a sociological signifier, a shorthand that often tells you who you're dealing with and what they're all about before they can even speak. There are a couple of different styles in play, and as a journalist you learn to develop a sort of internal chart. 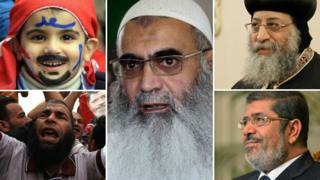 In Egypt, Muslim Brotherhood members generally tend to go with the full but well-groomed beard and moustache. However Salafists - the ultraconservative fundamentalist Muslims - like to let their beards grow long and wild, often leaving their upper lip clean-shaven as a nod to how the Prophet Mohammed wore his own beard 1,400 years ago. Some within the Salafist camp take things an extra step and dye their beards with henna, producing a range of colours from maroon to bright pumpkin orange. In a post-Hosni Mubarak Egypt, beards have made a big comeback. For years, beards were frowned upon as symbolic of the Islamist movements that Mubarak considered a threat to his reign. Government employees, ranging from police officers to EgyptAir pilots, were forbidden from growing a beard. But now, civil servants across the country are are calling for the ban to be lifted. Suddenly wearing a beard in Egypt has become an issue of civil rights and freedom of expression. The beard has even become a political reference point as well. The last few months have seen mounting protests against President Mohammed Morsi - a long-time Muslim Brotherhood official. One of the common protest chants translates as, "Shave off Morsi's beard/and you'll find Mubarak underneath!" It's not just a Muslim thing either. Most Coptic Christian priests and monks wear long beards as well. In fact when the new Coptic Pope Tawadros ll was chosen this year, it spawned a beard-related internet joke. Tawadros' beard looks EXACTLY like the beard of Emad Abdel-Ghafour - former head of the largest Salafist party. The beard is also a symbol of manhood and honour. I'll never forget an example of this from a session of the Organization of the Islamic Conference. It was back in March 2003. The US and British-led "coalition of the willing" was about to invade Iraq and tensions were running high. At one point an Iraqi and Kuwaiti diplomat got into a public shouting match and the Iraqi yelled, "A curse on your moustache!" This remains my favourite insult of all time. But facial hair is more than just a sociological identifier - it can also be a survival tactic. I spent two years reporting for the Los Angeles Times in Iraq after Saddam Hussein's overthrow, and my visual appearance was a key element in my ability to move around safely. As an Egyptian-American, I couldn't convincingly mimic the Iraqi accent, but I COULD pass a casual visual inspection. I put hours of thought into how Iraqi men my age dressed, the kinds of shoes they wore and how they wore their facial hair. Iraqis are a big moustache people - back to that whole manhood thing - and so for a couple of months, I abandoned my usual beard and attempted to grow an Iraqi-style moustache. It was a disaster - I could never get it to achieve that classic Saddam-level of bushiness. The experiment ended when I visited the US and my younger brother took one look and told me that I resembled a fat Freddy Mercury. Ashraf Khalil shared his thoughts with the BBC World Service programme The Fifth Floor. Listen back to the programme via BBC iPlayer or download a podcast .